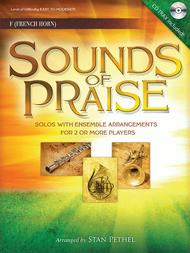 Sounds of Praise (Solos with Ensemble Arrangements for 2 or More Players French Horn). Arranged by Stan Pethel. For Horn (Horn). Instrumental. Softcover with CD. 24 pages. Word Music #080689338588. Published by Word Music (HL.113059).ISBN 1480308439. 9x12 inches.Sunday comes once a week and sometimes the second clarinet player goes on vacation! What this means for church instrumentalists is that there are plenty of Sundays to “praise Him with instruments” and church instrumental music should be flexible to meet various performance situations all year long. This collection meets those needs with playable, fresh, flexible arrangements. The arrangements are good lengths for preludes, postludes, and offertories as well as feature numbers for concerts and material for instrumental workshops and camps.